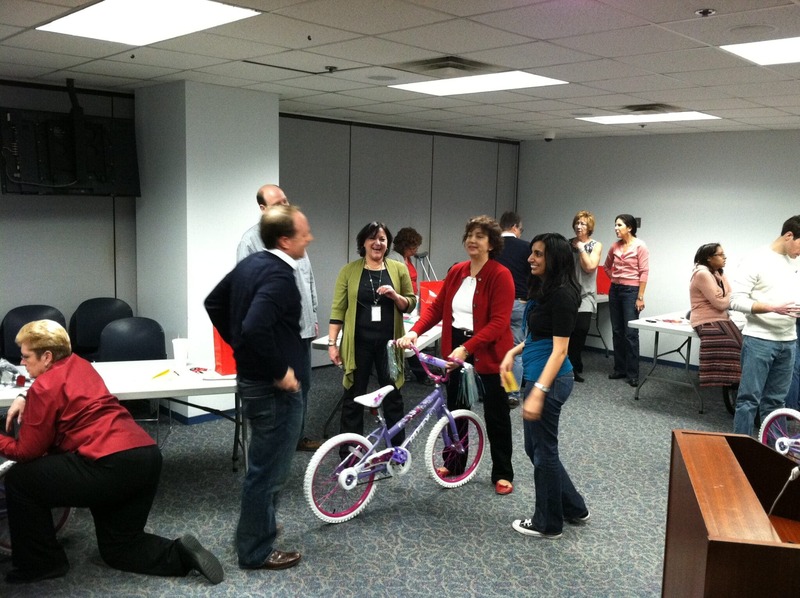 Horizon Healthcare included a Build-A-Bike team building event in their holiday party in Newark, New Jersey recently as a way to add more energy and fun! Horizon Healthcare Innovations is a subsidiary of Horizon Blue Cross Blue Shield of NJ, created to spark a catalyst for change in the Health Care System — Improve quality, affordability and patient experience in New York and New Jersey. This team was formed about a year ago, while Horizon Blue Cross Blue Shield of NJ has been around since 1932. 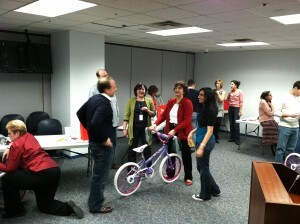 There were about 80 employees involved in the team building event. Build-A-Bike is a high-energy, fast-paced team building workshop that challenges teams to work collaboratively to reach their ultimate goal – building bikes for charity. Each team must engage in a series of problem solving quests that allows them to accumulate the parts necessary for building a complete bike. The Horizon team rose to the challenge, even finding creative ways to still reach their goal when some unexpected obstacles presented themselves! Horizon was looking to make sure that even though the members of this team often work in silos due to the nature of their specific jobs, they came together in a way that reinforced the fact that they are all part of one large team. The participants struggled at first to break out of their teams to share information and resources. But as the event progressed, they realized that they could much more successful by working together than apart. The group did not want to pull kids out of school in the middle of the day, so they chose to donate the bikes to the Boys and Girls Clubs of Newark and have an adult representative come to receive them. The 14 bikes that they built will go to children in a local community that would not have had much under their Christmas trees this years. 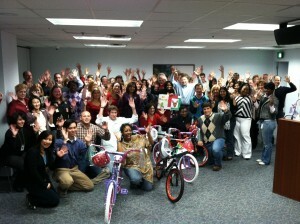 Knowing that they will help bring smiles to those kids’ faces really made the event special. The holidays are a particularly difficult time for families in need, especially when it comes to making them special for children. Including a Build-A-Bike event in your holiday party plans can help really light up the season for kids in your community! It’s also a great way to reinforce the message in the workplace that we are stronger by working together than when we stay in silos.